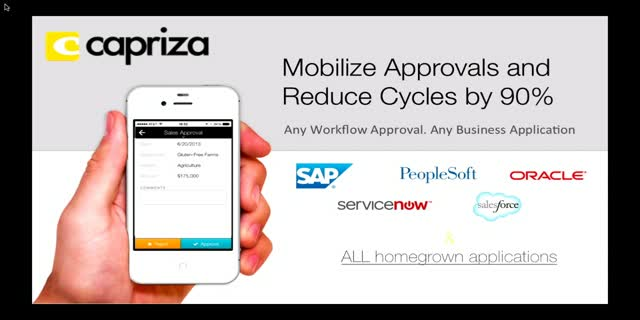 - Remove and prevent approvals backlogs while leveraging your existing business applications. Enterprise mobility empowers and liberates your workforce by accelerating critical business processes and boosting overall productivity. Early adopters of mobile development have already experienced these benefits as well as improved operational efficiencies, however most organizations struggle with the barriers imposed by skill set requirements (mobile developers), complicated architecture, and lengthy mobile app development cycles. During our session, Capriza will examine the benefits and challenges associated with mobilizing your enterprise and will introduce and explore Capriza's disruptive end-to-end mobility platform delivering rapid design and deployment of cross-platform mobile apps for even the most customized enterprise applications. We will discuss a few case studies of how DirecTV, Brocade, and Robert Half International are taking their businesses mobile and will conclude the session by designing and deploying a mobile app in 10 minutes without writing a single line of code or requiring complex APIs.